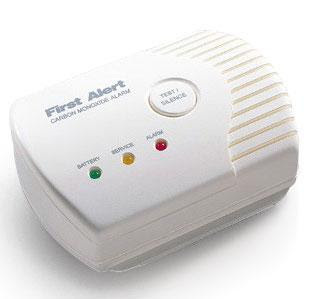 Time to update / replace / or get a new Carbon Monoxide detector for your house. Last night ours went off at about 10:30pm and it scared the crap out of me! I had been cooking that afternoon on the gas stove and I heard the heater come on in the building after being off all summer, so it naturally made me more worried. I figured out it was not the battery and called the fire department. Now the lady on the phone could not have been nicer, and said she would send the fire department out right away to check it for me... so, the first thing out of my mouth was "you don't have to send the whole department, I don't want to cause a scene, just one person will do." Not even 5 min. later and two fire trucks, an ambulance, and a police car were in the front of my building! Long story short the firemen could not have been more nice and helpful! They checked out the whole apartment and explained everything to me so I would not be afraid to go to bed. There ended up being no carbon monoxide in the apartment at all, but sometimes small amounts get built up in the detector because it is always testing the air and will trigger it to go off. He said the amount is nothing to get worried over, but I did the right thing in calling. Gotta love a man in uniform!! Anyways, mine is getting replaced today and everyone should double check theirs too because Carbon monoxide is the number one cause of poisoning death in America- a very serious thing! good warning! I need to change my out, it's like 15 years old!!! I'm glad you all are alright!! thanks for your sweet comment too!